while giving you the HIGHEST QUALITY of SERVICE. We take pride in our work and we bring that pride to every job we do. This is one of the reasons that 75% of our business is from return customers and referrals. We are LICENSED, INSURED and all of our work is fully GUARANTEED. ~ Oil Paintings, Fine Bric-A-Brac, Antiques, Oriental Carpets, & Haitian Cotton, Leather Furniture, Delicate Fabric Treatments. ~Homeowners call upon us for all phases of home cleaning and restoration. ~We quickly respond to Insurance Claims with immediate FREE inspection, consultation & appraisal. ~We provide shape-up services to Real Estate companies to prepare homes for resale and rental. Serving Long Island, New York Since 1984. ~ Pressure Washing of all surfaces such as; Wood Shakes, Vinyl Siding, Concrete, Brick, Asphalt, Pool Areas, Fences, Roof Shingles and Tiles. ~ Handwashing of Aluminum Siding. ~ Removal of Graffiti, Oil, Grease, Tar, Paint, and other hard to clean stains. 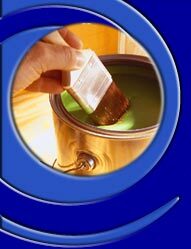 ~ Wood staining and sealing using the highest quality products, such as Cabot and other fine products. ~ Meticulous Prepping & Custom Painting. ~ Custom Painting - Benjamin Moore Paints. ~ Spackling & Repairs ~ Wall Paper Removal. ~ Complete Structural Cleaning Including Walls, Floors, Ceilings, Windows, Wallpaper, Tile, Rafters, Attics, & Basements. ~ Carpets, Upholstery & Window Treatments.